A white paper by the Gas Technology Institute’s Center for Methane Research is drawing attention in industry circles for arguing that methane emissions from the oil and gas sector have a much smaller impact on the global climate than virtually every other generally accepted scientific estimate. That would be huge news if it were true. But unfortunately, the conclusion is rendered completely moot by a compounding series of fundamental errors. In fact, had the authors done their math accurately, their results would have been very much in line with mainstream research which shows that human-caused methane emissions are responsible for a quarter of the worldwide warming we’re experiencing today. We can’t say whether the erroneous calculations were intentional or not. It’s worth noting, however, that EDF pointed out these mistakes to GTI staff when our scientists were asked to comment on a pre-publication draft. We will explain them again here, showing where the authors went wrong and what the numbers look like when they correctly reflect the underlying physics and chemistry. The GTI paper starts with sound data from the National Oceanic and Atmospheric Administration’s Annual Greenhouse Gas Index (AGGI). It’s the use of the data where the authors go wrong. Their conclusions are so far off the actual mark because there are basic errors layered on top of each other that lead to spurious conclusions. Knowledgeable experts will spot these problems immediately, but many others may not – particularly if they are only reading secondhand references or quotes. That’s why it’s important to unpack the math. 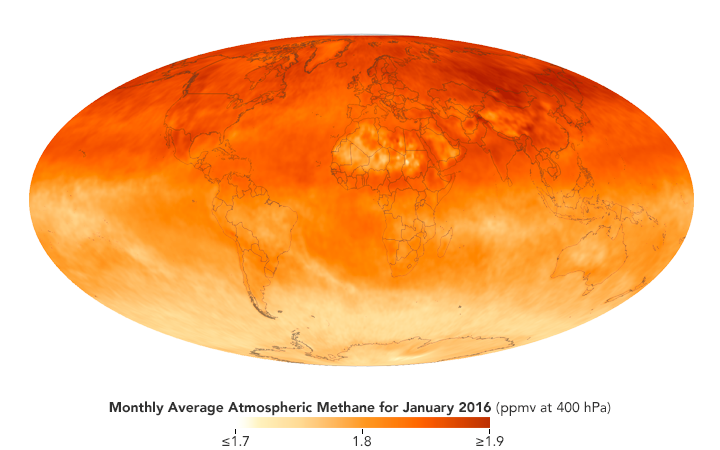 Methane emissions contribute to warming in two ways: directly, as a heat-trapping gas in itself, and also indirectly, via oxidation of methane into tropospheric ozone, stratospheric water vapor, and carbon dioxide – all of which are heat-trapping gases themselves. In fact, about a third of methane’s aggregate effect on the climate is known to come from these other components. Unfortunately, the GTI paper doesn’t look at methane emissions. Instead, the authors decided to look at methane concentrations. This choice leaves out the well-established indirect or secondary warming effects caused by methane’s indirect impact. As a result, their numbers are more than 30 percent too low right out of the gates. The GTI paper suggests total methane emissions are responsible for 16.7 percent of the warming we see today. But in fact, the real figure is at least 25 percent. The paper correctly notes that human-caused sources of methane (the two biggest of which are livestock and oil and gas activities) account for about half of all worldwide methane emissions. The other half comes from naturally-occurring sources like swamps and bogs. But because natural emissions are relatively constant over human time scales, they have not changed the Earth’s energy balance over the past few centuries; their impact on the climate is the same today as it was in preindustrial times. Where the GTI paper goes fundamentally wrong again, however, is by assuming that because half of methane emissions are natural, half of today’s climate impact from methane is also natural. But in fact the current climate impact from methane is entirely attributable to human activities. With the stroke of a pen, the GTI paper therefore reduces the estimated radiative forcing effect of human-caused methane – already too low by a third because of the first error – in half. .
Now, instead of the generally accepted, science-based estimate of at least 25 percent, the paper says human-caused methane emissions account for only 8.8 percent of today’s warming. In other words, the first and second systematic errors in the paper result in two-thirds of the problem disappearing by mathematical sleight of hand. Thanks to the first two mistakes, all the subsequent calculations also result in numbers that are far too low. Emissions from fossil fuel activities (coal, oil, and gas) account for about 20 percent of all methane (natural and human-made), but they represent roughly 30 percent of the methane from human activity (and recall that all of today’s warming from methane is attributable to human activities). – thereby arriving at an estimate that is half of what it should be. The authors compound this mistake again when calculating the impact attributable to the U.S. oil and gas industry, again producing an estimate that’s three- to four times too low. The fact is, methane emissions from the oil and gas sector represent the fastest, most cost-effective opportunity we have to slow global warming right now, in our lifetimes. When you add up all the misleading mistakes in the GTI analysis, it turns out the authors underestimate the true share of total, radiative forcing (proxy for today’s warming) attributable to oil and gas activities in the United States by about 3 to 4 times. That’s a big difference. Whether it was their intent to paint an imaginary picture of reality, it’s certainly the effect of the glaring miscalculations. The fact is, methane emissions from the oil and gas sector represent the fastest, most cost-effective opportunity we have to slow global warming right now, in our lifetimes. Most of the solutions are already being deployed in some places, as they are simple and straightforward. Many pay for themselves in just a short time. All of them together will make a huge difference. The actual numbers prove the case. This entry was posted in Methane, Natural Gas. Bookmark the permalink. Both comments and trackbacks are currently closed.